Looking for the perfect wood stove accessory, but can't find something truly unique? Your search is over. With this creatively designed and painted steamer, you can add healthy moisture to your air while evoking the natural beauty of the sea. 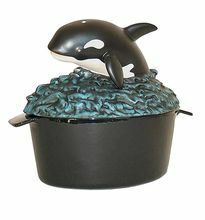 A jumping orca and ocean waves cast in high quality porcelain top a sturdy cast iron pot that holds two and a half quarts of water. Leave this steamer on your stove even during the summer when there is no need for a fire-it is a great conversation piece that all your guests will love. Leave it to Minuteman to create a one-of-a-kind accessory that is as attractive as it is useful.